While there are many injuries which can lead to a shoulder problem, there are a few injuries that are generally more prevalent among the population: they include ‘rotator cuff syndrome’, ‘frozen shoulder’, bursitis, thoracic outlet syndrome, impingement syndromes, and bicipital tendonitis. While these are only several of the more popular ones, the correct diagnosis leads directly to treatment options. 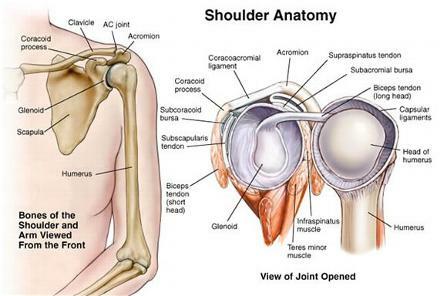 The shoulder has the most range of motion of all the joints in the body. It’s considered a “ball and socket” joint, although it’s more of a “ball and saucer” by configuration. The “ball” of the joint(head of the humerous) connects to the glenoid fossa(saucer) of the shoulder blade. In order to assist in deepening the ‘saucer’ for a better contact, there is a thick cartilage labrum which surrounds the fossa. The shoulder is maintained by a series of muscles which enhance movement, and ligaments which keep excessive movement in check. Rotator Cuff – There are 4 muscles that make up the rotator cuff: supraspinatus, infraspinatus, subscapularis, and teres minor. These 4 muscles are responsible for spinning the arm along its long axis in a variety of positions. One such movement would include bending the elbow to 90 degrees and turning the hand toward the body(internal rotation) and away from the body(external rotation) along that axis. 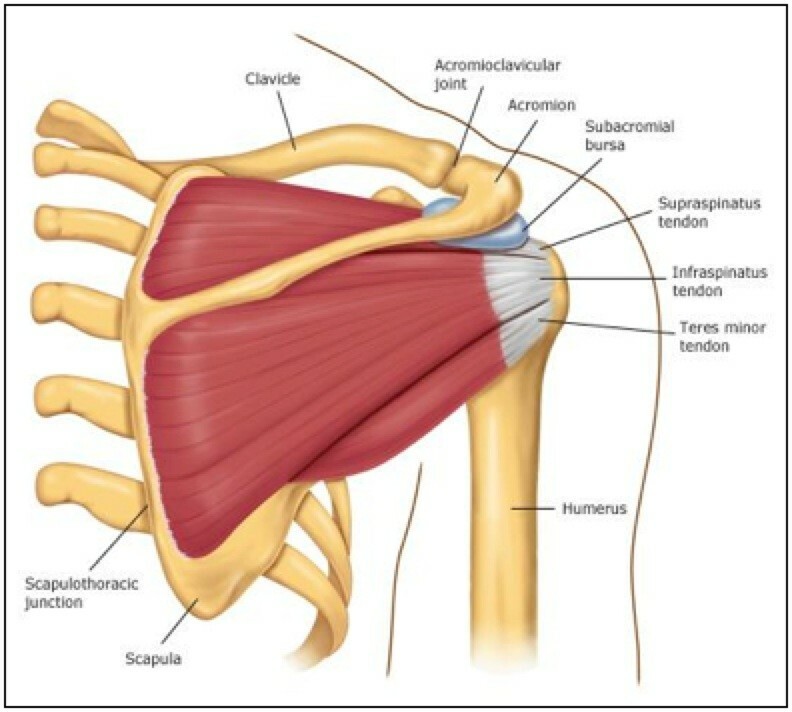 In order for these muscles to work there has to be “wonderous synchonicity” of coordination with all the other bigger muscles that act on the arm and shoulder blade(scapula). The position of the scapula is also important, and the rotator cuff muscles are only 4 of the 17 that attach to it. The shoulder blade is also a bone that lays suspended in the muscles of the back – and it’s only bony attachment is at the top of the shoulder where the collarbone(clavicle) and scapula meet- the A/C (acromioclavicular) joint. There are also a series of ligaments that check shoulder motion and prevent too much movement. As the most mobile joint in the body, the highest range of motion comes with some potential problems. 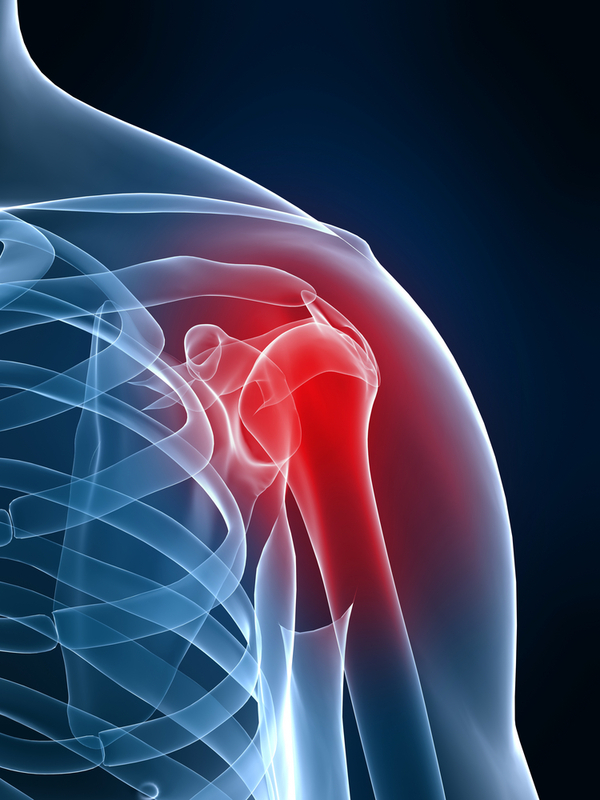 If the shoulder is injured, the ligaments that surround it (capsule) can shorten from scar formation and result in a limitation of motion that can be quite debilitating(“Frozen Shoulder” – also known as adhesive capsulitis). The ligaments most affected are on the underside of the arm and scapula and prevent raising of the arm in virtually all directions, keeping in mind that all ranges need to be full for in a healthy shoulder. Another injury that can cause pain and irritation to the shoulder is “bicipital tendonitis.” This is an inflammation of the proximal (near the shoulder) tendon of the biceps muscle, often causing it to slip out of the grove it slides in. While most injuries to the biceps tendon are from sheer overload, others are from repetitive use traumas. Even though this injury is easily diagnosed, it is often a frustrating repair process requiring strict patient compliance. The key to shoulder diagnosis can be narrowed down by range of motion tests and some orthopedic testing. As for ranges of motion, a patient may be asked if they can move their arm without discomfort thru what’s referred to a “painful arc”. Failure to do so is significant of “impingement” syndromes – where the tendons of the top aspect of the rotator cuff gets trapped between he arm and the rof of the shoulder joint – the acromion of the shoulder blade. The pain is usually felt between 80-120 degrees of motion when the arm is raised laterally along the side, where below 80 degrees of movement and above 120 degrees is NOT painful, but the middle part is. There are a series of bursas in that area as well, and inflammation of those can also add to the problem (bursitis). While the rotator cuff muscles are primarily responsible for internal and external rotation, they’re also responsible for keeping enough tension on the head of the humerus(the ball) to keep it in constant contact with the glenoid fossa (the saucer) of the scapula at all times. Injury to any one of these muscles can alter the synchronous movement and cause an imbalance that requires both passive and active modalities – as well as exercises – to successfully correct. Additionally, any nerve interference from the neck in the form of disc injury or subluxation can cause weakness and/or send radiating pains into the shoulder, arm or hand. Ligament injury can limit shoulder movement quite severely. If the capsule of the shoulder is damaged in any way, the resulting repair process can limit movement when the scars shorten. Additionally, there is a resultant muscle weakness (atrophy) that occurs considering that the muscles are incapable of successfully acting on the shoulder. In these instances, shoulder rehabilitation becomes a bit more comprehensive since there are multiple concurrent problems to address – some primary, some secondary. Medical terminology is quite specific when it comes to sprains of the shoulder. A “dislocated” shoulder refers to the articulation between the humerus and the shoulder blade only, while a shoulder “separation” refers to the articulation between the clavicle and shoulder blade. Depending on the type of injury mentioned above, the treatments will most likely include passive and active forms of physical therapy as well as exercises and adjustments. Since each injury is unique, it’s best to seek out a qualified practitioner to fully evaluate the condition. Additionally, don’t be surprised if you should hear a chiropractor or competent therapist address postural concerns as well!! This is where chiropractors transcend the medical field with regard to fully addressing the mechanics of the shoulder AND the shoulder blade – which includes the rib cage it sits on. All these concerns need to be addressed in order to assure proper and as complete a healing process as possible.